A remarkable weekend in North Florida came to a close with two SEC teams advancing on to the Sweet 16. LSU played two similar games. In both, they managed to squander away large leads late in the second half, only to eek out a close victory in the end. On Saturday, Maryland dug themselves out of a 15-point deficit and briefly took the lead in the closing minutes. After Skylar Mays hit a deep three pointer to break the tie and propel LSU back in front, the electrifying Jalen Smith responded with a triple for the Terrapins. It was high drama in Jacksonville. 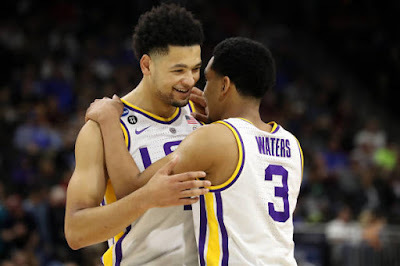 With just over a second to go, Tremont Waters made an off-balance layup that sealed LSU’s ticket to the regional final in Washington, D.C.
As the final buzzer sounded, Tremont found himself at the bottom of an emotionally charged dog pile of teammates in front on the LSU bench. After the 79-77 victory, Tigers interim coach Tony Benford tried to put it all in perspective. “It’s huge for these guys. They’re the ones that paid the price. They’ve been through a lot,” Benford said. In the LSU locker room, there’s an outpouring of support for Wayde. Everywhere you turn you hear his name, you see the tributes, he’s still very much a part of the team. I’m not talking about suspended coach Will Wade. Wayde Sims’ life was tragically cut short after a fight escalated into gunfire. On the day before their first practice of the season, a teammate was fatally struck down in Baton Rouge. The Kentucky Wildcats are also advancing to the third round. After rolling past Abilene Christian in the opener, Wofford was certainly not a team to take lightly. The Terriers led for much of the first half and consistently fought off any Kentucky momentum swings down the stretch. However, for a team that’s lived and died by the three-point shot, any aspirations of Sweet 16 or even Final Four glory were subsequently laid to rest. These are just some of the words used to describe the offensive output of Wofford senior Fletcher Magee. With over 2,500 career points, and the record for most three-point baskets in NCAA history, nobody could envision such a futile stat line. Magee’s a legend and will always be a part of Wofford folklore, but 0-for-12 from behind the arc? It seems unimaginable to even to type. Despite Magee’s struggles, Wofford had opportunities to advance. Afterwards, Wofford coach Mike Young had a hard time keeping his emotions in check. This marks the 15th time a John Calipari coached team has advanced to the Sweet 16. “I mean these kids, I told you before, what they go through, what they hear, what’s thrown at them, I just appreciate the kind of kids we have and the kind of families they come from,” Calipari said.